This report deals with the movements of people to, from, and within SMSA's of 250,000 or more. Residents of these SMSA's are classified as to whether their location was in the central city or in the ring of the same SMSA in 1960, and movers are classified in terms of metropolitan or nonmetropolitan residence in 1955. Table 1 summarizes the movements of people among SMSA's and the arrival of new residents from nonmetropolitan areas, giving a rough characterization of distance spanned in terms of "same State" or "different State." Table 2 distinguishes origin in terms of individual SMSA's of 250,000 or more, whereas table 3 gives origin in terms of individual States of 1955 residence. Table gives the demographic, social, and economic characteristics of in-movers to the central city and outlying ring of the SMSA, according to types of origin. Tables 5 and 6 give similar information for out-movers from these SMSA's. Finally, table 7 shows the number of movers in the detailed streams within the SMSA's of 500,000 or more. The data on residence in 1955 were derived from answers to the following questions on the FOSDIC form. Residence on April 1, 1955, is the usual place of residence five years prior to enumeration. Residence In 1955 was used in conjunction with residence in 1960 to determine the mobility status of the population. The category "same house as in 1960" includes all persons 5 years old and over who were reported as living in the same house on the date of enumeration in 1960 and on April 1, 1955. Included in the group are persons who had never moved during the five years as well as those who had moved but by 1960 had returned to their 1955 residence. The category "different house in the United States" includes persons who, on April 1, 1955, lived in the United" States in a different house from the one they occupied on April 1, 1960. For the purposes of several tables in this report, these persons were subdivided into four principal groups according to their 1955 residence, viz., (1) central city of the same SMSA, (2) ring of the same SMSA, (3) other SMSA, and (4) nonmetropolitan area. In some tables the latter two categories were further subdivided into "same State" and "different State." For persons who are living in a different State from the 1955 State of residence, the data in table 2 indicate whether the interstate move occurred between contiguous or noncontiguous States. States have been classified as contiguous if their boundaries touch at any point.22 The category "abroad" includes those with residence in a foreign country or an outlying area of the United States in 1955. (In the coding of this item, persons who lived in Alaska or Hawaii in 1955 but in other States in 1960 were classified as living in a different State In 1950). Persons 5 years old and over who had indicated they had moved into their present residence after April 1, 1955, but for whom sufficiently complete and consistent information concerning residence on April 1, 1955, was not collected are included in the group "moved, place of residence in 1955 not reported." (Missing information was supplied if data were available for other members of the family.) Also included in the category "moved, place of residence in 1955 not reported" are persons who gave no indication as to their movement since April 1, 1955, but who, on the basis of the final edited entry for year moved (for which all nonresponses were replaced by assigned entries), were classified as having moved into their present house since April 1, 1955. The census statistics on mobility provide information on the number of movers, migrants, etc., and on in-movement and out-movement for a given area. These statistics, however, do not take into account all the different moves that were made in the five-year period. For example, some persons in the same house at the two dates had moved during the five-year period but, by the time of enumeration, had returned to their 1955 residence. Other persons made two or more moves. Some movers during the five-year period had died and others had gone abroad. Regardless of the number of moves made, a person is counted only once as a mover in the census data. Persons who moved were not asked the number of miles they had moved. The census information, however, provides some indication of the relative distance involved in the moves. On the average, a person who moves within a metropolitan area moves a shorter distance than one who moves to another area in the same State, who in turn moves a shorter distance than a mover to a contiguous State, and so on. Comparison of the characteristics of migrants and other movers with the characteristics of the nonmovers gives some indication of the selectivity of migration and other types of mobility. It must be borne in mind, however, that the characteristics relate to the period after the move and some do not necessarily relate to the period before the move. A five-year period, as chosen for use in the 1960 Census, should give a more representative picture of recent mobility than does the one-year period that has been used in other censuses and surveys. Nonetheless, the last five years of the 1950-1960 decade may have had a somewhat different mobility history from the first five years. Hence, figures on net movements computed from the statistics of this report may indicate a different net direction or suggest a different annual rate as compared with estimates for the same areas made by the "residual" method for the entire decade, even when allowance is made for variations in coverage. The data presented in this report will permit analysis of the net exchange between SMSA's of 250,000 inhabitants or more in 1960. During the tabulation of statistics on residence in 1955, it was discovered that some enumerators working in counties containing central cities of SMSA's, but outside the cities themselves, had failed to identify correctly these central cities as places of previous residence. For the convenience of the enumerator and the coder, the FOSDIC document contained a circle for "This city" for indicating that the place of 1955 residence was the respondent's city or town of 1960 residence. Some enumerators understood this category to refer to a nearby large city and filled the circle when they should have written in the name of that city in P13a of form PH60-3. Since the city that actually contained the place of residence was frequently a central city of an SMSA, the statistics were impaired. After a limited study of the relevant materials, including some of the Household Questionnaires (which gave the respondent's own written reply), it was decided that a simple mechanical edit would tend to Improve the statistics. This mechanical edit applies to entries for persons living in unincorporated parts of counties containing the central city of an SMSA (or other city with a population of 50,000 or more). For these persons, a code of "This city" was tabulated as the largest city in the county. This edit was not used in New England, New Jersey, or the urban townships of Pennsylvania since it was considered likely that the category "This city" was used to refer to the torn or township rather than to the large city. For the same reason, in all States, entries for persons living in incorporated places were not edited. Finally, codes of "This city" for persons living in unincorporated areas outside counties containing central cities of SMSAs (or other city of 50,000 or more) were tabulated as "balance of county" since it was not clear what city, if any, was intended. Prior to the mechanical edit, there was an underreporting of movement from a central city to its outlying ring. Overall, it appears that the published statistics are substantially better than would have been the case had the corrective edit been omitted. The edit may have overcorrected the error in some SMSA's and undercorrected in others. There was considerable variation in the error rate from one SMSA to another. Hence, caution still needs to be exercised in using the statistics. In addition to the evidence just discussed, there is some indication from the 1940 Census and from a pretest for the 1950 Census that the number of movers from large cities tends to be overstated at the expense of adjacent areas. This overstatement probably results from a tendency of migrants from the suburbs or other part of the outlying ring to give the central city as their former residence. It is thought that this tendency is particularly characteristic of long distance migrants. For example, migrants from the unincorporated urban fringe, or even from a small satellite city, to a distant area may often give the central city as their previous residence, since the name of their actual former place of residence would not usually be familiar in their new locality and might require further explanation. Accordingly, despite the great interest in the total number of movers from large cities, it was decided to limit the 1960 tabulations on that subject to movers within the metropolitan area. Even for these relatively short- distance moves, however, some bias may have persisted. If so, it would not affect the figures on in-movers but would affect figures that could be computed on net movement. 3. If within the annexation-as a mover from ring to city. It is not known how well the above instruction was followed. Moreover, it was not given to the respondents who filled the Household Questionnaires. The importance of annexations during the 1950-1960 decade can be gauged from table 9 in the Volume I report for each State. Those annexations occurring between April 1, 1955, and March 31, 1960, are of the most direct relevance. When a large annexation appears to constitute a potential problem, it is suggested that the user of the present report, study table P-1 in the appropriate Final Report, PHC(1), Census Tracts, to see whether movers living in annexed tracts were reported in unusually high proportions as originating in "other part of this SMSA." In table 4, mobility status is cross-classified by year moved into present house. Some of the inconsistencies are only apparent but others are real. For nonmovers ("same house" in 1955) reports of dates after April 1, 1955, could well be correct since the question applied to the date of the last move and the person may have both left the housing unit and returned during the five-year period. On the other hand, the relatively few movers ("different house" in 1955) who are shown as having moved on or before April 1, 1955, represent erroneous classifications. No attempt was made to eliminate these inconsistencies by editing. 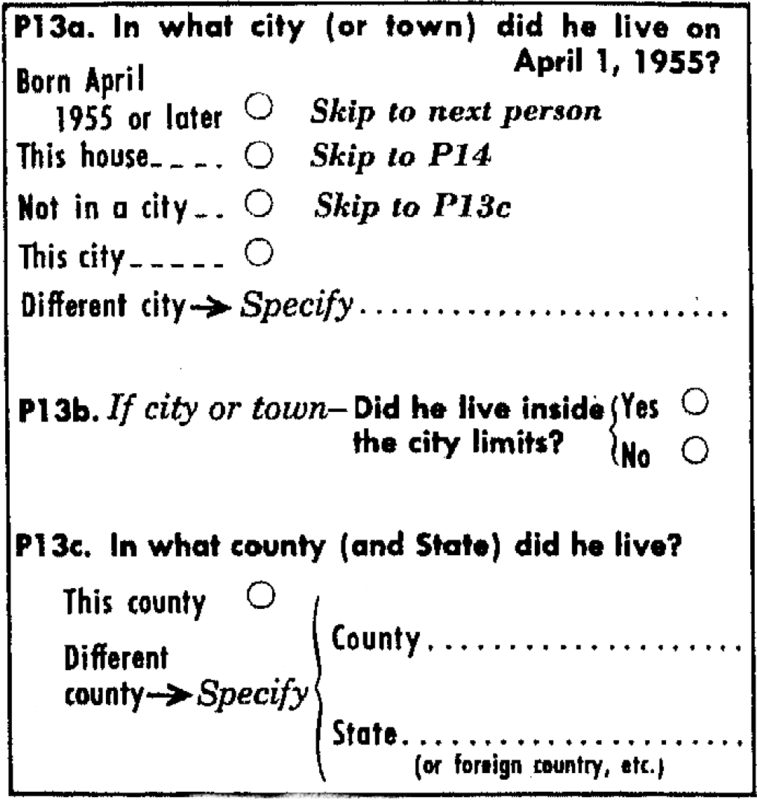 Similar questions on mobility were asked in the 1950 and 1940 Censuses. However, the questions in the 1950 Census, as well as in annual supplements to the Current Population Survey, applied to residence one year earlier rather than five years earlier. In the 1950 reports, migrants reporting the State but not the county of residence in 1949 appear in the known categories of migration status and State of origin, whereas in this report such persons were all assigned to the category "moved, place of residence in 1955 not reported." This partial nonresponse group comprised 411,590 migrants in 1950; the corresponding figure for 1960 is not known. Although the questions in the 1940 Census covered a five-year period, comparability with that census is reduced somewhat because of different definitions and categories of tabulation. In 1940, the population was classified in terms of four categories: Migrants, nonmigrants, immigrants, and migration status not reported. The first group, "migrants," included those persons who in 1935 lived in a county (or quasi-county) different from the one in which they were living in 1940. The second group, "nonmigrants," comprised those persons living in the same house in 1935 as in 1940 as well as persons living in a different house in the same county or quasi-county. The group classified as "immigrant" in 1940 is comparable to the group classified in 1960 as "abroad." The 1940 category, "migration status not reported," Included persons for whom information supplied was not sufficient for the assignment of a more specific category. In accordance with census practice dating back to 1790, each person enumerated in the 1960 Census was counted as an inhabitant of his usual place of residence or usual place of abode, that is, the place where he lives and sleeps most of the time. This place is not necessarily the same as his legal residence, voting residence, or domicile, although, in the vast majority of cases, the use of these different bases of classification would produce identical results. It has long been recognized that for many types of analysis it is necessary to consider as a unit the entire population in and around a city, the activities of which form an integrated economic and social system. Prior to the 1950 Census, areas of this type had been defined in somewhat different ways for different purposes and by various agencies. Leading examples were the metropolitan districts of the Census of Population, the industrial areas of the Census of Manufactures, and the labor market areas of the Bureau of Employment Security. To permit all Federal statistical agencies to utilize the same areas for the publication of general-purpose statistics, the Bureau of the Budget has established "standard metropolitan statistical areas" (SMSA's). (In the 1950 Census, these areas were referred to as "standard metropolitan areas.") Every city of 50,000 inhabitants or more according to the 1960 Census of Population is included in an SMSA. The definition of an individual SMSA involves two considerations: First, a-city or cities of specified population to constitute the central city and to identify the county in which it is located as the central county; and, second, economic and social relationships with contiguous counties which are metropolitan in character, so that the periphery of the specific metropolitan area may be determined.>sup>3 SMSA's may cross State lines. 2. If each of two or more adjacent counties has a city of 50,000 inhabitants or more (or twin cities under lb) and the cities are within 20 miles of each other (city limits to city limits), they will be included in the same area unless there is definite evidence that the two cities are not economically and socially integrated. a. It must have 50 percent or more of its population living in contiguous minor civil divisions5 with a density of at least 150 persons per square mile, in an unbroken chain of minor civil divisions with such density radiating from a central city in the area. b. The number of nonagricultural workers employed in the county must equal at least 10 percent of the number of nonagricultural workers employed in the county containing the largest city in the area, or the county must be the place of employment of 10,000 nonagricultural workers. c. The nonagricultural labor force living in the county must equal at least 10 percent of the number of the nonagricultural labor force living in the county containing the largest city in the area, or the county must be the place of residence of a nonagricultural labor force of 10,000. 5. In New England, the city and town are administratively more important than the county, and data are compiled locally for such minor civil divisions. Here, towns and cities are the units used in defining SMSA's. In New England, because smaller units are used and more restricted areas result, a population density criterion of at least 100 persons per square mile is used as the measure of metropolitan character. b. 25 percent of those working in the county- live in the county or counties containing central cities of the area. Only where data for criteria 6a and 6b are not conclusive are other related types of information used as necessary. This information includes such items as the average number of telephone calls per subscriber per month from the county to the county containing central cities of the area; percent of the population in the county located in the central city telephone exchange area; newspaper circulation reports prepared by the Audit Bureau of Circulation; analysis of charge accounts in retail stores of central cities to determine the extent of their use by residents of the contiguous county; delivery service practices of retail stores in central cities; official traffic counts; the extent of public transportation facilities in operation between central cities and communities in the contiguous county; and the extent to which local planning groups and other civic organizations operate jointly. a. The name of the SMSA includes that of the largest city. c. In addition to city name, the area titles contain the name of the State or States in which the area is located. That part of an SMSA that is outside the central city or cities is referred to in this report as the ring. 3 Central cities are those appearing in the SMSA title. A "contiguous" county either adjoins the county or counties containing the largest city in the area, or adjoins an intermediate county integrated with the central county. There is no limit to the number of tiers of outlying metropolitan counties so long as all other criteria are met. 4Nonagricultural labor force is defined as those employed in nonagricultural occupations, those experienced unemployed whose last occupation was a nonagricultural occupation, members of the Armed Forces, and new workers. 5 A contiguous minor civil division either adjoins a central city in an SMSA or adjoins an intermediate minor civil division of qualifying population density. There is no limit to the number of tiers of contiguous minor civil divisionsas long as the minimum density requirement is met in each tier. The classification is based on the age of the person in completed years as of April 1, 1960, as determined from the reply to a question on month and year of birth. The data on year moved into present house refer to the most recent move the person made. Thus, a person who had moved back into the same house (or apartment) in which he had previously lived was asked to give the date at which he began the present occupancy. If a person had moved from one apartment to another in the same building, he was expected to give the year when he moved into the present apartment. The category "always lived here" consists of persons who reported that their residence on April 1,1960, was the same as their residence at birth and who had never had any other place of residence. The questions on educational attainment applied only to progress in "regular" schools. Regular schooling is that which may advance a person toward an elementary school certificate or high school diploma, or a college, university, or professional degree. Schooling that was not obtained in a regular school and schooling from a tutor or through correspondence courses were counted only if the credits obtained were regarded as transferable to a school in the regular school system. Schooling which is generally regarded as not regular includes that which is given in nursery schools; in specialized vocational, trade, or business schools; in on-the-job training; and through correspondence courses. Elementary school, as defined here, includes grades 1 to8, and high school includes grades9 to12. College includes junior or community colleges, regular 4-year colleges, and graduate or professional schools. 3. A child of the head is a son, daughter, stepchild, or adopted child of the head of the household. 5. A nonrelatlve of the head is any member of the household who is not related to the household head. This category includes lodgers (roomers and partners, relatives of such persons, and foster children) and resident employees (maids, hired farm hands, etc.). Family consists of two or more persons in the same household who are related to each other by blood, marriage, or adoption; all persons living in one household who are related to each other are regarded as one family in a primary family, the head of the family is the head of a household. The data on employment status relate to the calendar week prior to the date on which the respondents filled their Household Questionnaires or were interviewed by enumerators. This week is not the same for all respondents because not all persons 'were enumerated during the same week. Employed persons comprise all civilians14 years old and over who were either (a) "at work"-those who did any work for pay or profit, or worked without pay for 15 hours or more on a family farm or in a family business; or (b) were "with a job but not at work" - those who did not work and were not looking for work but had a job or business from which they were temporarily absent because of bad weather, industrial dispute, vacation, illness, or other personal reasons. Information on income for the calendar year 1959 was requested from all persons 14 years old and over in the sample. "Total income" is the sum of amounts reported separately for wage or salary income, self- employment income, and other income. Wage or salary income is defined as the total money earnings received for work performed as an employee. It represents the amount received before deductions for personal income taxes, Social Security, bond purchases, union dues, etc. Self-employment income is defined as net money income (gross receipts minus operating expenses) from a business, farm, or professional enterprise in which the person was engaged on his own account. Other income includes money income received from such sources as net rents, interest, dividends, Social Security benefits, pensions, veterans' payments, unemployment insurance, and public assistance or other governmental payments, and periodic receipts from insurance policies or annuities. Not included as income are money received from the sale of property (unless the recipient was engaged in the business of selling such property), the value of income "in kind," withdrawals of bank deposits, money borrowed, tax refunds, and gifts and lump-sum inheritances or insurance payments. In the statistics on family income, the combined incomes of all members of each family are treated as a single amount. Although the time period covered by the income statistics is the calendar year 1959, the composition of families refers to the time of enumeration. For most of the families, however, the income reported was received by persons who were members of the family throughout 1959.